We dread to face interviews which are the actual key to success. It is important to approach the questions asked in the interview in a prepared and correct manner with the right attitude. and so forth may seem difficult to answer from the viewpoint of a candidate and analysis of the answer to such questions depends upon the individual view of person to person. This question cannot have fixed technical answers but it is expected to give answers in such a way that the candidate is able to motivate the HR manager with his attitude displayed in such answers. The main objective of the HR in asking such questions is to find out about your thoughts and dreams of the candidate. So it is best to prepare yourself, as what can you contribute to this company answer can be locking point in an interview. This is one of the common question you will be asked at almost every job interview. It is actually an opportunity to prove yourself, how you can be different from the other candidates or how better you can add value to the company. Before answering any question in an interview, it is very important to prepare how you are going to answer the question. The best way to answer is by providing all your past achievements and accomplishments. Assess how it will be helpful for you in future. Also make a good research about the company, it will give you an idea about the company goals and work culture. Use this information to answer this question by incorporating your skills and traits along with it. Always be positive and show your interest towards working for the company. It is better to provide your past achievements so that the employer would know how good you are at work. The best way to do this is by providing examples. As mentioned above , use the data which you have like the company needs, goals etc along with your work experience educational qualification , skills etc. Make use of all these data and create a best answer to impress your interviewer. Make sure that you do not only focus on your specialties. It is essential that you need to connect your answer to the company goals . Also the features or skills you possess must be related to your company niche and the employer must find you helpful , if you get selected in the interview. You need to be effective and flexible enough to mold according to the company needs. A very common interview question mostly asked by employers in interviews. One main thing that most of us do not understand is that , when the interviewer asks such tricky question he mainly observes how the candidate handles the situation. Your answer does not matter but it is your way, how you answer the question cracks the code. Combine with company need and goals. The employer always look for candidates who can be an asset for their organization. They always want their employee to be creative, innovative and provide best of solution to improve your company growth and success. So to provide an convincing and appropriate answer to this question, keep this points in mind. Generally, people do answer affirmatively at the time of interview but after that –actually, no one bothers. It is necessary for the HR to understand that the candidate should know about the company and the job he is going to be offered. He should understand what contribution the candidate will make to the company or aspires to bring when he will join the company. Obviously, no one will expect that a candidate can change the world around just by joining but atleast, given an opportunity after joining, he should have something to say for the benefit of the company. The following tips will let you prepare in different ways to answer the same repeated question. 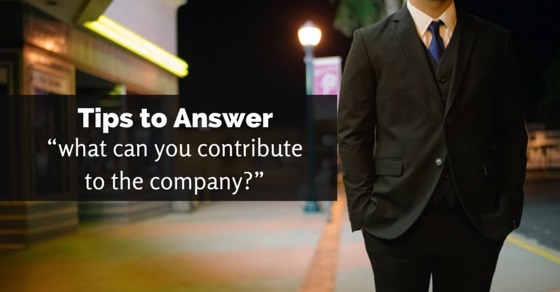 The best way to answer this question is to give valid proofs that you have contributed well in your past companies. And then relate to them what else can you achieve in future. Describe how effective you were in different positions offered to you. Talk deep about the experiences you had while accomplishing some major tasks of your past companies. Describe if any changes you have brought to your past companies which have been implemented. You know the profile assigned to you before attending the interview. So, you can relate your abilities to the goals of the company. Let your interviewer know that you have the required skills to be selected for the job. You have the desire to meet challenges and you have the flexibility to work for the company and its employees and management as per the right terms and conditions. Every HR knows that the candidates learn the answers from the internet and come and speak here. But your answer shall be different from all. You don’t need to exaggerate things like I can generate double the revenue of the company or I can open new branches of the company abroad. Be practical and answer with logic. You need to be very specific and match your aspirations with the skills you have and the willingness of the employer in accepting the changes you might propose to bring to the company. Read about the company and its future plans and arrangements. Know about the past of the company and highlight the downfalls and say that you will work well to overcome those figures. Point out to one of their arrangements and highlight any aspect which you think you are confident at and can achieve on your own for the good of getting the contract for the company. If you do not have such references, don’t fake. It will depress the interviewer. Start your answer by giving a synopsis about yourself. Your USP shall be a one sentence statement of what you are. It is equal to personal branding or value added statement. Your USP will reflect your biggest strength and it shall contribute as a major benefit from your side to the company. When HR Managers hire, they consider the candidate as an investment of the company which will give returns in future. This can only happen when the past results of the candidate has shown that he is really interested in his area of work allotted to him. If it is proved that the candidate has interest since long in such areas, then the candidate will work willingly and will try to contribute to the company if not today, then, in near future. Every company will have profit making goals and growth policies. And given a chance, if a candidate speaks about the contribution to the profit of the company, the HR understands that the objective of the candidate matches with the goals of the company. Show that you have potential skills and past experience to reach the goals of the company in the form of profit maximization and stability. Say that your integrity and dedication towards your profession will be when you manage to contribute from your side to the company you join. By your professional qualification, a company can get a better thinker, planner and advisor for certain backlog aspects. Since, you are a professionally qualified candidate, express that you have the updates and follow ups to make the company at par with the other companies of the industries. It is taught in your profession to work for the company and build long lasting relations with the company as well as its members. Read the job profile, description and surf the website of the company. Find out what they are looking for the people they would appoint. Then analyze your skills and experience and prepare an answer how you demonstrate them when asked questions. The HR will understand that you have interest in the company’s upbringing, if not specifically, then in general. This nature if highlighted will create a good impression on the HR. Suppose, you have the skill to communicate with people, then you can say that you can make the organization grow by managing and handling the clients and customers. You can say that you have better negotiating skills which will prove yourself as an asset to the organization if you are applying for a marketing job. You need to think out of the box. A project or task assigned to you in past could not have been important at the time of execution but can be an excellent subject to discuss when asked what you have contributed to your past companies. In modern days, the basic key to the growth of the company depends upon the attitude of its employees. A fundamental attitude of the employee should be work hard and adapt to the working environment. Collaborate with the teammates and prove that you are one of the assets of the organization and the company will have to think twice if they lose your services. Employees play a major role in the profitability of the organization. Fast learners and passionate people are always welcome. In the growing modern world of e-commerce, companies are switching over and searching for employees who can change and adapt well to the changing system. They need candidates who know the technical term and are familiar with the latest trends. A candidate has a very good opportunity to show that he is a tech savvy and can contribute his skills for the company by making the company switch over from manual to automatic systems wherever possible. The employers expect a ‘to the point’ answer when they ask this question. If you can give the answer within one to two statements along with logic, you can impress the interviewer. You will have to be careful while speaking to match your previous answers to this question as well. A “to the point” answer will show that you have simple thoughts and are prepared for the questions. To show the HR the reason why they should hire you, you need to prove what makes you best fit for the positions, you have to prepare a concise statement which will explain what you have to offer to the company. Don’t discuss skills which are not relevant to the job. Stress on the goals of the employer and try to match your goals with them. First understand a very important fact that the interview is not a time where you have to discuss your life history. The interviewer wants to know how you can add value to their organization. It is about how you can solve the problem of the organization by filling a job vacancy with you as a qualified person. Only talk about how you can apply your knowledge to their organization. Show them whether you can identify the values and visions of the company. Every company has some strength and strong points. Search on those, for example, if a company has a motto “Integrity of customers” you can emphasize the quote in your answer and express your willingness to be in the team and your belief in the same motto. Bring your passion, your hard work and potential on the table. An excellent way to answer is to show overall who you are and why you shall be a great fit for the position called for. How fast you are and how adaptable you are to learn things. HR may recruit someone with fewer skills but he will always choose passionate and hard working people. Even highlight your extracurricular activities which may give fame to your company when you will be associated with them as an employee. On paper, qualification shall be overruled if you reflect from your words that you have motivational skills to become a part of company’s mission. It is universally known hardest fact to talk about yourself but overcoming this obstacle and getting the job is one best thing a successful candidate can do. To achieve success, a contribution from your side must count. Work best to achieve success in life be it interviews or working to contribute to the company.